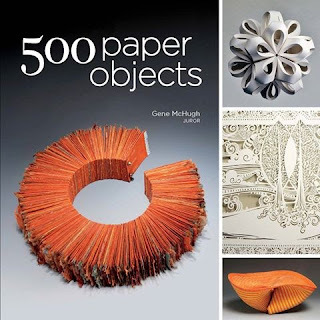 "Paper craft is a dynamic medium that's in the midst of a renaissance—and this entry in the very popular 500 series reveals the creative work of today's most gifted and original artists and the limitless potential of the craft. Juried by Gene McHugh, an award-winning arts writer and well-established expert in the field, the book presents a broad range of techniques, forms, and aesthetic approaches, with magnificent examples of origami, kirigami, cutting, quilling, papier-mâché, and casting." I've been waiting a long time for it to be published and it was finally released this past June and it is exciting to see 3 pieces of mine featured in the book! The book is available on Amazon and has a great preview too. Lots of my favorite paper artists are in there so it's definitely worth picking up.